Episode 22: "No Holiday for Murder"
Charlie Chan and son, Barry, in Brussels, Belgium, meet members of a group of tourists on an international tour. On disgruntled member of the group, Mrs. Remington, is seen berating the tour organizer, Professor Ambrose, a professor at an American college, for anything that has gone awry, including the momentary loss of her purse. As Mrs. Remington takes out her anger on Mary Ann, her personal secretary, the brusque Max Willis comes to her defense, later muttering, "One of these days I’ll murder that dame." Barry hits it off with Sharon Prince, a young member of the tour group. Sharon invites Barry along for a sightseeing tour and Charlie Chan agrees to the idea, saying that he will arrange for Barry and himself to join with the tour for the afternoon. At the Congo Museum, Max Willis proves himself to be a vast repository of knowledge contrary to his apparent rough edges, as is seen as he corrects Professor Ambrose as to a fact of history during the museum tour. Mary Ann, who has taken an obvious liking to Max, is forbidden by Mrs. Remington to see him. The members of the tour group then go their own way, much to the frustration of Professor Ambrose. As Chan explores the museum, there is a sudden scream followed by the sight of Mrs. Remington tumbling down a flight of stairs. Mary Ann hastily follows down the stairs, obviously shocked by what has just happened. As Barry and others arrive, Chan pronounces Mrs. Remington dead as Mary Ann faints in Barry's arms. Chan mentions that before Mrs. Remington died, she whispered to him that someone had pushed her down the stairs. Later, interviewing each of the members of the tour party, Inspector Vernet of the Brussels Police hears Professor Ambrose tell of Mrs. Remington's abusive behavior toward Mary Ann Edwards. It comes out through Ambrose that Miss Edwards had recently been under care in a mental hospital. It appears to the inspector that it is a simple case of a mentally unstable Mary Ann who was pushed too far by her overbearing employer. Chan, doubtful, asks to see Mrs. Pendleton's purse. Two things interest Chan. First, a part of a drawstring, found in Mrs. Remington's hand, that had gone with her jewelry bag as seen earlier by Chan at the hotel as Mrs. Remington had checked the contents of her handbag. Second, Chan notes that the jewelry bag is missing from Mrs. Remington’s purse. Chan theorizes that Mrs. Remington died as a result of a struggle at the top of the stairs with a thief who was after the jewels which Mrs. Remington made no secret of carrying with her. During the struggle Mrs. Remington was pushed down the stairs to her death. Barry then notes the information he saw in a letter he had found earlier. No longer in Barry's pocket, Max Willis offers it up, mentioning his earlier career as a pickpocket. Max had written the letter to an old cellmate of his at Sing Sing prison where Max had served time for armed robbery. Max then hurriedly confesses to the theft of the jewels and the murder of Mrs. Remington. As Max it taken into custody, Professor Ambrose quickly rounds up the members of his tour party to head back to their bus outside of the museum. Looking at his watch, the Professor lets Barry know that the bus will arrive at any moment. 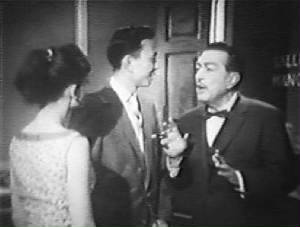 Barry tells a perplexed Charlie Chan that he doesn't believe that max killed Mrs. Remington either and that he made his "confession" in order to protect her. Chan's mood brightens as Barry shows him a photograph he took elsewhere at the museum just moments before Mrs. Remington's death. Chan hurries off with the photo to find Inspector Vernet.. With Vernet, Chan hands him the photograph, explaining that his Number One Son has proven the innocence of Mr. Wilis. The image, taken in the museum's garden, distinctly shows Willis sitting in the background. Chan explains that Willis had made his false confession in order to protect Miss Edwards. Suspicion now reverts to Mary Ann. Chan makes an overseas call to "an institution in the United States" as the inspector hurries off with Barry to hold the tour bus as four o'clock approaches. Minutes later as Vernet rounds up the tour members, Chan rushes in asking the whereabouts of Mary Ann. Vernet tells him that she became hysterical and that Professor Ambrose has taken her into the museum's garden to calm her down. Chan then states that they must find them immediately. In the garden, Ambrose walks a calmed Mary Ann across a bridge spanning a large peaceful pond. Thanking the professor, Mary Ann suggests it is getting late and that they should return to the tour group. Ambrose then reminds Mary Ann of her fragile mental health, seeking to convince her that it was she who pushed Mrs. Remington down the stairs to her death and that the best way out for her would be to commit suicide my drowning herself in the pond. Suddenly, Mary Ann remembers with clarity that she was not with Mrs. Remington at the crucial moment as she had moved off momentarily to look at an exhibit. Hearing approaching voices calling out to Mary Ann, Professor Ambrose subdues Miss Edwards in an attempt to kill her before the search party arrives. Seeing the violent struggle on the bridge, Chan and the approaching group hurry to the scene as Ambrose is about to push Mary Ann into the water below. Chan pulls his gun and wounds Ambrose who drops Mary Ann. Chan then correctly suggests that the missing jewelry is on the professor's person. As Mary Ann and Max leave in each other's arms, Chan notes to Barry two things that pointed to Ambrose as the possible murderer: first, Ambrose's ignorance of a very obvious fact of history and second, the phone call to America revealed non-existence of the college where Ambrose claimed to be a professor. Barry Chan (to Sharon): "My Pop used to head up the Honolulu Police. Maybe you've heard of him - Charlie Chan?" Congo Museum - After the Congo Free State was recognized by the Berlin Conference of 1884-1885, King Léopold II of Belgium decided to show the potential of the country in an exhibition. 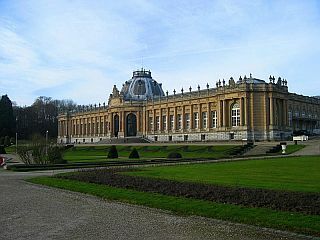 The king decided to have the exhibition in his royal estate at Tervuren, near Brussels. When the 1897 International Exposition was held in Brussels, a colonial section was designed by the Belgian architect Albert-Philippe Aldophe. In 1898 the Palace of the Colonies became the Musée du Congo (Congo Museum), and the African exhibits it contained from the Exposition became permanent. Due to the avid collecting of research scientists, the museum's collection soon grew too large for the institution which required the addition of more exhibition space. King Léopold II wanted not only an Africa Museum but also Chinese and Japanese pavilions, and more. Construction on the new museum, designed by the French architect Charles Girault in a neoclassical "palace" style, reminiscent of French Petit Palais, began in 1904, with large gardens extending into the Tervuren and Sonian Forests. The completed museum and grounds were officially opened by King Albert I in 1910 and named The Museum of the Belgian Congo. In 1952 the adjective "Royal" was added, and in 1960 the museum had its name changed to The Royal Museum for Central Africa. Max Willis (to Professor Ambrose): "Excuse me, Professor, Magellan didn’t discover the Congo, it was Diogo Cao." Diogo Cão - (ca. 1452-1489) A Portuguese explorer and one of the most notable navigators of the Age of Discovery who made two voyages sailing along the west coast of Africa to Namibia in the 1480s. 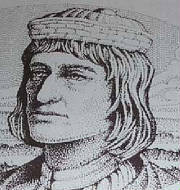 In 1482 and 1485, Diogo Cão explored the area of what is today the Congo in Africa. Ancient wisdom says, "Anger very bad for digestion." Wise old Chinese friend one said, "Two birds on branch sing sweetly, but third one changes melody to discord."